Among the first international arrivals to Cabo San Lucas, or so the story goes, was a shipwrecked Japanese sailor named Hatsutaro who floated ashore in May 1842 to find just two houses and a mere 20 inhabitants. He’d need a hefty tequila shot to make sense of the place now. A 20-mile corridor on the southern tip of Mexico’s Baja California peninsula, Los Cabos runs from Cabo San Lucas to San José del Cabo. Between them there are nearly 15,000 hotel rooms, from spring-break basic to pillow-topped, infinity-edged, fairway-fronting splendor. The vibe can be quaint or untz untz raucous, depending on one’s mood. After a devastating 2014 hurricane, a building boom refreshed classic properties and introduced new places to sip, dine, and loaf under the ever-present sun. Even our O.G. castaway might pass up a rescue now. Self-service breakfast gets the haute treatment at La Cremería, a lavish “street market”—as if—at Chileno Bay Resort & Residences ($575-$4,050), a new Auberge resort in Cabo San Lucas (aka Cabo). The property is set on one of Cabo’s only swimmable beaches; the riptides and undertow elsewhere are no bueno. Even so, the hotel’s pool is the main draw. It’s laid out on three tiers with a zero-edge design and is long enough for couples, families, and kids to believe they each rule their roost. One could stay here the entire weekend and be content. More adventurous types rise early and make the 25-minute drive to find calm waters around El Arco, the rock arch that nature graciously created for Instagram selfies. 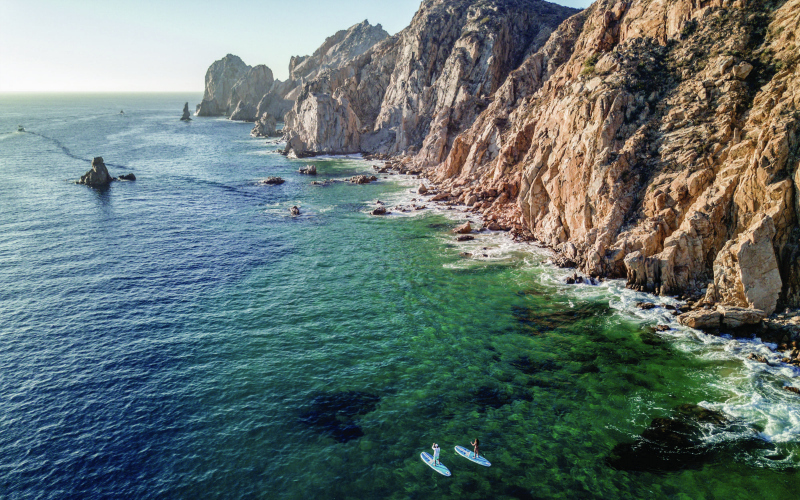 Cabo SUP, an outfitter in town run by an American couple from Montauk, New York, offers rentals, lessons, and tours. Lover’s Beach, off to the right, is on the calmer bay side, while Divorce Beach (no joke) faces thrashing open waters. By midmorning, the margaritas are already flowing at Monkey’s Cave Bar, the open-air hole-in-the-wall that’s the place to go in Cabo when you have absolutely nowhere to be. Amid the cobblestone lanes of San José del Cabo, La Lupita Taco & Mezcal is the best choice for Oaxacan grasshopper tacos, which taste way better than they may sound. Nearby Obregon Street is the heart of a growing arts district. Casa Dahlia and Patricia Mendoza showcase Baja’s top contemporary artists. Mata Ortiz is the place for traditional and modern pottery. If you’re crunched for time, at least visit Frank Arnold, whose abstract paintings and tabletop sculptures sell around the world. San José del Cabo Art Walk is a popular event held from 5 to 9 p.m. every Thursday. For something more indulgent, spend like Oprah on an afternoon treatment at the Spa at Las Ventanas al Paraiso, which has an in-house healer and a twilight energy-cleansing ritual said to be inspired by the ancient Maya. With so many expats in the area, it’s only natural that certain big-city signifiers would make their way to tables. Drinks in mason jars, farm-to-bar libations, chalkboard menus—all have come to this part of Los Cabos. Although Flora Farm gets the most media attention, the in-the-know crowd flocks to Acre (pronounced AH-CRAY) at sunset, where Vancouver cocktail designer (and GM) Danielle Tatarin plucks ingredients from the property’s 25-acre organic farm. Her signature offerings are as cheeky as they are delicious, like the bourbon, lime, and vanilla concoction Tatarin calls “South of the Wall.” Since Uber is off-line here, consider overnighting in one of 12 new tree houses, each with a terrace, bathroom, closet, shower, and king-size bed ($275-$475). Accommodations come with earplugs to drown out early morning birdsong, but there’s little to be done about middle-of-the-night sway. The Rooftop at the Cape, at Cabo San Lucas’s Brutalist-chic Thompson Hotel on the beach, is the only rooftop bar and lounge in the area; it’s also a glamour spot for fresh-as-the-view crisp kunafa shrimp and the house mezcal-infused passionfruit cocktail. If you absolutely must, there’s an Amazing Cabo Bar Crawl that lets vacationers party their way through downtown Cabo by taking on puzzles and drinking challenges. A more sophisticated and romantic alternative is dinner at the Resort at Pedregal’s El Farallon. The evening begins with flights of bubbly and a mole tasting on the champagne terrace before moving to the outdoor dining room notched into a cliff above the ocean. For $150 a person, you point to the fish, steak, and/or lobster you want grilled, and cozy up under blankets as the waves pound the rocks below. The lights sparkle along the crescent of coastline; the sea air is fragrant, warm and breezy. Honestly, it’s enough to make you want to play Cabo castaway forever.